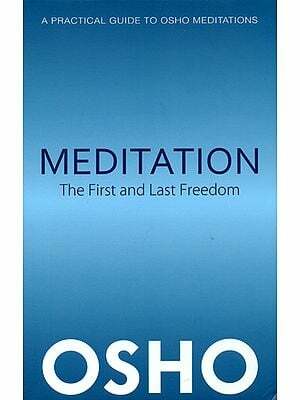 Despite the interest in meditation, few works have studied what meditation means within the original traditions. 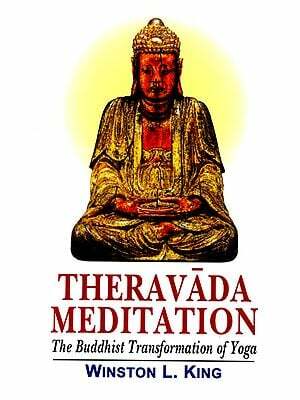 Meditation Differently presents a translation of an important Tibetan work which contrasts and compares two central traditions of Buddhist meditative practice - the Mahamudra and the rDzogs-chen, particularly the sNyingthig version. This traditions is supplemented by a detailed commentary based on original Tibetan sources by Dr. Guenther, an eminent scholar of Buddhism and modern thought. This critical commentary is a hermeneutical and phenomenological study of the key ideas in the understanding of being and experience, utilizing development in modern thinking to bring out the nuances of Buddhist thinking. Dr. Herbert V. Guenther is Professor Emeritus of Far Eastern Studies at the University of Saskatchewan. In over 25 books and numerous articles he has communicated in contemporary languages the living spirit of Buddhism as it bears on the perennial problems of human existence. Recently Dr. Guenther has been cited by the Ananta-Jyoti Vidyapitha for his outstanding contributions to Buddhist studies. 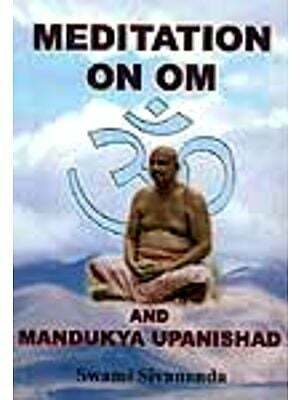 OVER THE LAST few-decades meditation has captured the imagi- nation of many people, especially the younger, as a means to guide them in their personal development. This is both a re- discovery of one's innate potential and a rectification of the unbalanced attitude to which Western man under the impact of a dehumanizing technology has succumbed and from which he on and off has attempted to escape by usually ill-fated ego-trips. However, the concept of meditation is not precise and eventually will have to be replaced by others more fully descriptive and elucidative of the processes involved. 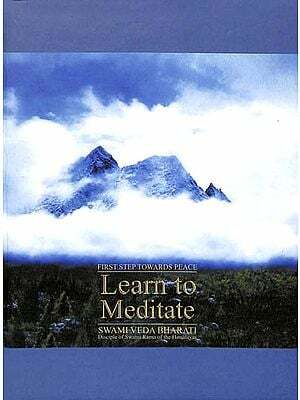 Within the Indo-Tibetan cultural milieu at least three closely related, though highly differentiated concepts are available: dhyana (bsam-gtan), bhavana (sgom-pa), and yoga (rnal-'byor). But it is in the Tibetan context that all these concepts have been deeply probed as to the subtleties in lived through experience which they attempt to convey. Two approaches or modes of inquiry are detectable. The one, which is the older (rnying-ma) one and living on in rDzogs-chen thinking, is hermeneutical and offers an interpretation which understands through an inner- standing, because it has its origin in the lighting of Being (to use a "Heideggerian phrase) as one's primordial ontological potential. The other approach belongs to the newer (gsar-ma) tradition of the Mahamudra teaching and reflects the strictly Indian preoccupation with.objectification in which the 'lighting of Being' is dimmed and its luminous field put in abeyance in order to have a tighter hold on -the object. Nowhere are these two approaches more conspicuous than in the assessment of what to understand by the concept of bsam-gtan which is probably the most complex one amongst the three above-mentioned ones. Its general use in connection with what we would call 'concent- ration' or a 'focusing of the mind on something objectively given', in other words, an imaginative dealing with an objective reference, is only one of its meanings. The important and diver- gent aspects noted by the Tibetans, have been mostly ignored in Western presentations that reflect a depressingly sad state of affairs: psychologists, as a rule, have no knowledge of the original texts (be they in Sanskrit or Tibetan) and have to depend on haphazard translations by linguists who, steeped in 19th century mechanism and reductionism, either have little or no knowledge of what thinking as a creative process means and involves, or conceive of thinking as a problem-solving activity and, where it becomes a matter of divergent Tibetan and Indian patterns of thought, suffer from a severe case of 'Sanskrit-only' glaucoma which makes them blind to Tibetan hermeneutical thinking so that they are content With a mechanical transposition of words from one language into another, desperately trying to suppress any traces of experience and understanding. As the Tibetans noted concentrative processes (bsam-gtan) are primarily referential (rten-can) in the sense that they contain a referent which is both a 'world-frame' (to use a term coined by E. Casey), an external phenomenologically present domain (phyi snang-ba'i yul)' specified as sense-specific colored shapes, sounds, fragrances, flavors, and tactility, and a 'noematic nucleus' (a Husserlian term) of the concentrative-imaginative process whose -presence' tends to become more or less reified in the imaged gestalt of a felt presence termed a god (lha'i sku), its emblems (phyag-mtshan) as symbolic expressions of its function, or, continuing an earlier naive realism that stood at the begin- ning of Buddhist thought (and by implication, meditation-con- centration), a so-called 'real', 'physically' existing wooden stick (shing-bu) or a pebble (rde'u). There is still another referential aspect which is lacking the externalization and reification of the noematic nucleus and remains purely 'imaginative'. Its characterization as 'non- referential' (rten-med) is to be understood as -non-externalizable' and -non-reifiable', not in the sense of there being no reference whatsoever, as a 'literal' (uncomprehendingly mechanical) trans- lation would suggest. The referent in this concentrative-imagi- native process is the imaginary, yet strongly felt, presence (snang- bcas) of the organism's dynamics described in terms of its chreods (standing-wave patterns, rtsa), the currents moving along these patterns (rlung), and the overall organizing dynamics (thig-le), claimed to be a non-dichotomic, conceptually undis- turbed and undivided (mi-rtog-pa) experience, as well as audibly Imaged gnosemes (yi-ge), visibly imaged globes of pure light Cod-kyi gong-buy; feelingly imaged rotary movements within and constituted by the chreods (rtsa'i 'khor-lo) and an inner fire igtum-mo'i me). Lastly, there is, however paradoxically it may sound, a referent or sensum with no noticeable reference (snang- med), a kind of 'pure sensation' or 'staring' into some non- dichotomic (mi-rtog-pa) dimension. In whatever nuances this concentrative activity may appear it remains in the service of an egological subjectivity (sems-'dzin-pa) with its inveterate grasp- ing and holding to what it has grasped ('dzin-pa)3. Since it prescinds from the ecstasy of visionary non-egological Being (rig-pa)4, it is counted to be of a low-level activity in which those who do not know better, who still have not outgrown their childhood (byis-pa) engage. Or, to put it even more bluntly, such concentrative activity is an affectation (bcos-ma), deliberately initiated by the intellect (blo) which operates on the metaphysical assumption that the intellectual order it imposes on reality is representative of the world which it pre- sumes to be reducible to unchanging structures of universal validity. Strictly speaking, such rational and egological concentrative activity, geared to the reinforcement of the notion of a static cosmos, has little to do with concentration as a process of centering. Rather, it is a de-centering of psychic activity, a channelling of its stream into the backwater of dichotomic thought that inevitably leads to stagnation. From a dynamic perspective, concentration means that the divergent trends of psychic life con-verge into a single point such that the process becomes centered in itself and thereby leads to an extraordinary intensification of itself and of life in general. As against the 'artificiality' of the intellect's concentrative activity, this self- centering (rang-babs) and self-abiding (rang-gnas) concentration is the most natural (rang-bzhin) activity of one's cognitive potential that in its ec-static intensity (rig-pa) is an utter open- ness and undimmed radiance. This important distinction between an object-oriented and a self-centering process is met with again in what is described as 'one-pointedness' (rtse-gcig) or as a 'one-pointed in-depth appraisal' (rtse-gcig ting-nge- dziny), implying by the term'dzin that the mind's 'grasping' of what it set down before it, is still operative, though in a highly attenuated form. In object-oriented concentration this one-pointedness simply means focal attention to something that has been isolated and abstracted from its environing world and, . by implication, is exclusive and unres- ponsive to the connective tissue of the matrix of one's seeing. The appeal this kind of concentrative meditation has, lies in the fact that everything remains as it is, because essentially it is but a reconfirmation of the rational mind's tendency to dominate and control. As against this reductionist aspect of concentrative (object- oriented) meditation there is another more dynamic and process- oriented aspect that marks a withdrawal from the engagement with. 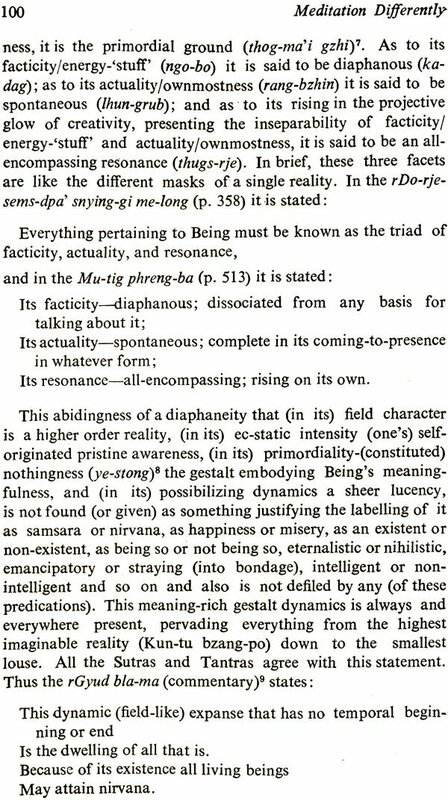 these dispersive tendencies and a gathering of the energy getting lost in them into a 'point' that in its restful motion (gnas-'gyu)13 is the level where mind as we ordinarily understand it is poised to either pass beyond itself into the wholeness of Being or revert to its 'normal' dichotomic functioning. Inasmuch as this process of a gathering, of becoming increasingly centered in itself, does not know of any fixation, the older concept of bsam-gtan with its predominantly static connotation has been replaced by the more dynamic one of rnal-byor, which describes the individual's tuning in to or linking up with (byor) Being's dynamic genuineness (rnal) or, as we might say with reference to what is called one-pointedness, its stillpoint, involving foul' vector feelings of different intensities that cannot be torn apart without mutual destruction. Summed up under the code term "The Fourfold Tuning-in" (rnal-'byor bzhi), they are the cornerstone of the Mahamudra teaching which is the hallmark of the various bKa' -brgyud-pa schools that once flourished in Tibet. out of its mother's womb or the mythological garuda bird that has broken the egg in which it had been hatched and immediately soars into the sky. As we shall have occasion to note, rDzogs-chen teaching distinguishes between three levels of psychic life. The lowest level is that of ordinary persons whose 'concentration/meditation' (bsam-gtan) consists in what Comes dangerously close to developing a fixation; the intermediary level is that of the person who by tuning in (rnal-'byor) to the forces working in and through him approximates wholeness; and the highest level is wholeness itself whose intelligence' exceeding all limits is referred to as dgongs-pa suggesting some 'superintelligence' or 'super- thought' or -supermind' that is irreducible to any lower level, be this called bsam-gtan or rnal-byor. 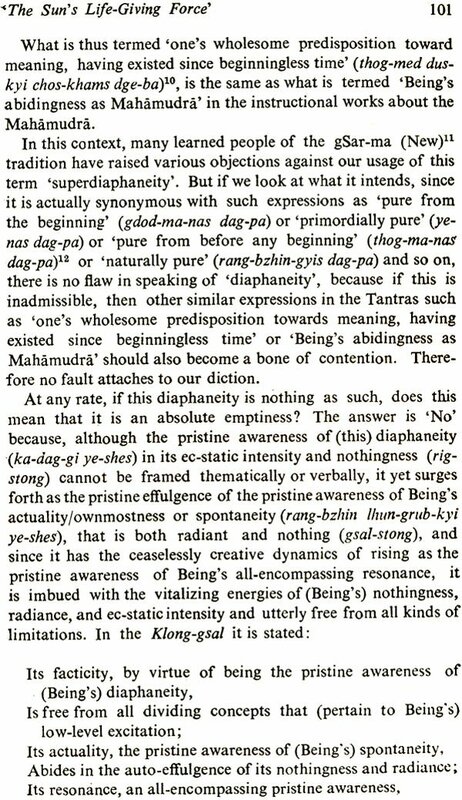 In Chos-dbyings, p. 68, Klong-chen rab-'byams-pa gives a concise account of the above: The self-existing pristine awareness (rang-byung-gi ye-shes), undivided by concepts dealing with objects, is a self-abiding 'concentration' (rang- gnas-kyi bsam-gtan) its uncreated spontaneity is a yogi's concentration (rnal-'byor-pa'i bsam-gtan); the inner calm and 'out-of-the-ordinary' perception (zhi-lhag, short for zhi-gnas and lhag-mthong) that comes by 'staring' one-pointedly at an object (yul rtse-gcig-tu yid-la byed-pa) is the concentration of worldly people who do not know better ('jig-rten byis-pa'i bsam-gtan). The difference (between the, two kinds of concent- ration) is that the latter continues building up the tendencies (that hold a person prisoner in the world), the former does not. The self-abiding dynamics of the ec-static intensity (rig-pa) is (one's) mind intending and suffused by (the whole's) pellucidity and consummation (byang- chub-kyi sems) and it is called 'the superthought of Being's possibilizing dynamics' (chas-nyid-kyi dgongs-pa). One's cognitive capacity (shes-pa) that manifests itself in its concern with objects is calledsamsaric mind"; it arises in the dichotomic pattern of subject and object. The only contemporary author (in any language) with requisite understanding of both the subject matter, the languages in question (Indic, Tibetan, and European) and the concerns of the serious reader not content with the often insultingly over-simplified or under-informed presentations that seem to be mostly commercially motivated. This work lays bare specific information that most Tibetan &quot;masters&quot; of today either don't know about or won't reveal to their audience. As Guenther has pointed out elsewhere, the aire of secrecy is often maintained to hide a lack of understanding or knowledge. This work covers essential ideas concerning the rDzogs-chen that are it's most complex and subtle (and hence, usually &quot;secret&quot;) notions and ideas. Anyone interested in the topic should own this book. There are, by the way, problems with the later index numbering of references, but they can be sorted out by the reader. Still, given the rarity of the information covered, the coherence of its presentation and the prerequisitory nature of the information, it is a &quot;must-have&quot;.